Plastic Fantastic – No it really isn’t! It may be a catchy pop tune, but we don’t all live in a Barbie world, life in plastic is definitely NOT fantastic! We live in the real world and the battle to rid our planet of the dangers of plastic is a problem that is becoming more and more apparent. According to the UN environmental programme, our oceans now contain more than ’51 trillion micro plastic particles’. 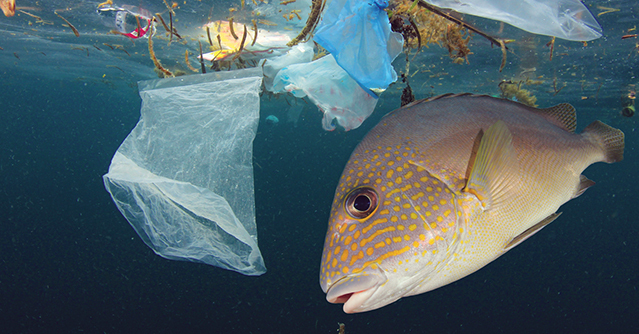 That’s a scary thought, but even more worrying is that in less than 40 years it’s predicted that our oceans will contain more plastic than fish, and humans are now starting to unknowingly eat it too. Every year an estimated eight million tonnes of the plastic enters our oceans, and this will just increase more and more over time. Already ‘plastic is a regular feature along the coastlines of Indonesian beaches, settling on to the ocean floor at the North Pole, and rising through the food chain on to our dinner tables’, says Erik Solheim, head of the UNEP. Bearing this threat in mind the food and drinks manufacturing industries are under immense pressure to come up with new ways of branding and packaging their goods. The food and drink industry have used plastic packing since the 1930s. Plastic unfortunately is used in every stage of the industries process from ‘manufacturing to retail’. So, obviously the food and drink industry are being put in an uncomfortable situation by being encouraged to stop using plastics altogether. Besides there being too much plastic, the main problem with it is that it doesn’t biodegrade. No natural process can break it down. So what’s the solution? Sharon Todd, head of marketing at glass manufacturer Ardagh says ‘there are no reasons why there can’t be a return to glass packaging for many popular food and drink items.’ Glass is completely non-toxic and also offers excellent food preservation qualities. However, John Haken, director at WF Denny, packaging and partyware specialists, suggests that to change packaging from plastics to other materials ‘could increase the cost of items by 20%’, which again proves a problem as are consumers willing to pay extra for their food and drink items? Initiatives are being set up amongst manufacturers and major food retailers to help combat the ever-increasing battle of the plastics. However, many people believe that returning to using glass or aluminum as packaging is reverting back in time. Supermarket giant Iceland’s director for sustainability, Richard Walker disagrees though, he offers that ‘the onus is on retailers, as leading contributors to plastic packaging pollution and waster, to take a stand and deliver a meaningful change.’ Iceland is currently working with Europe’s last cellulose factory to come up with a solution. “Here at Ragus we have been investing in technology that helps reduce our carbon emissions, water consumption and packaging efficiencies since 2007. In 2013 Ragus moved into a state of the art refinery, one of the most advanced of its kind operating a closed system resulting in the manufacturing being highly resource efficient. The Ragus factory’s suppliers and services such as the delivery tanker fleet and laundry supplies also operate sustainably. Virtually all our packaging is recycled, and the plasti-pallets and larger storage containers for transport are asset managed. This ensures they come back to us to be cleaned and reused. Simple steps such as introducing coloured sampling and decanting buckets, means they can be washed and not thrown away”. For more information on products and on our flexible packing solutions contact sales@ragus.co.uk.